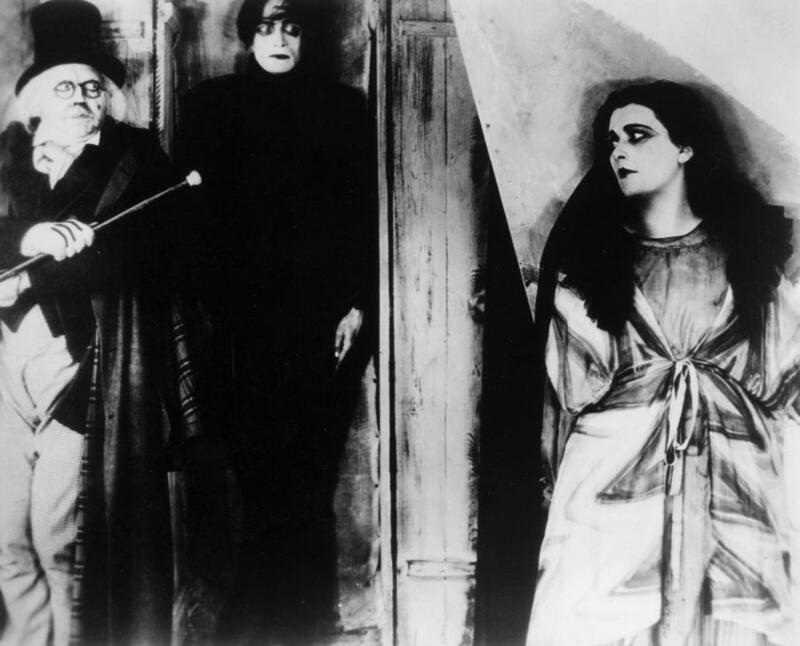 “The Cabinet of Dr. Caligari and his Somnambulist Cesare” Since this movie is a silent film, I found that I had to rely mostly on the facial expressions and the set design to help me through the story. Because of the absence of dialog, the soundtrack also helped deliver the expression that the film was trying convey. I felt the editing help contribute positively to this particular style of film, for instance, in one scene in the movie; they would keep cutting to Dr. Caligaris facial expression after Cesare would tell the person in the crowd the horrific news of his fate to be the following morning. This type of editing invites the audience into the sick and psychotic mind of Dr. Caligari. There was this small, old, grey haired man sitting in the lobby at the fair waiting to apply for a permit to show his exhibit at the fair. The message, I believe, the filmmakers tried to get across to the audiences at that time is that how can an old, grey haired, Doctor harm anyone. Just for the fact that he is a Doctor adds credibility and would lead the audience to believe that this man does not have any deadly intentions, that when we discovered how mentally ill he was, that was a shock to us. For this films time and limited production, I found the use of the set design and art helped contribute to the story as well. The sharp angles identified the villain, and the round and softer shapes indentified the heroine who would soon have her fate sealed because of her naive and gullible ways. I think the filmmakers did a terrific job having a limited production the way they did. The entire movie was shot on a stage but yet carried the story for over an hour and was versatile enough to accompany many environments. On one occasion, I did notice that they did paint a particular room and used it in another scene. I like the way the filmmakers had Dr. Caligari wear white gloves with painted fingers. In one scene, he would entice the heroine into his tent to view his exhibit of the somnambulist, Cesare, and his white hand was highly contrasted against the black tent opening. That scene was very well thought out! I found that to be very menacing and that would also convey to the audience her almost certain doomed fate. This movie had very interesting camera work as well. Before the scene would end, the camera shutter would close and circle in on the characters face capturing the facial expression, then upon the next scene, open only enough to expose another characters face before opening all the way and leading us into the next act.